Despite the fact that he's just lined up another acting gig, suave busybody Justin Timberlake has also decided to confirm Questlove's hints at a sequel to The 20/20 Experience. He's even set a release date for the project. Taking to social media, Timberlake shared the above image on his Instagram page. 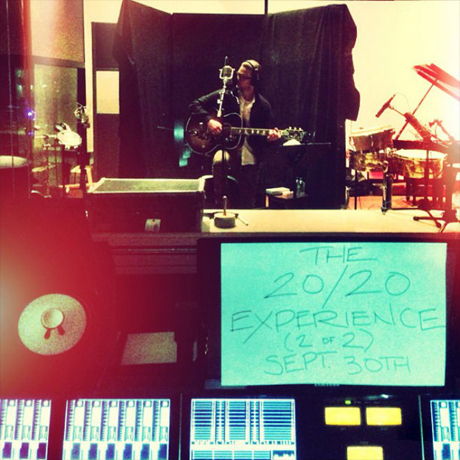 The heavily filtered pic sees JT rocking an acoustic guitar in the studio and bears the caption "THE 20/20 EXPERIENCE (2 of 2) SEPT. 30TH." For now, that's all we've got, but when it comes to being a fan of Timberlake's what more do we really need? There was a seven-year gap between his last two albums, so we're just thankful that he's got more music on the way so soon. UPDATE: A press release has confirmed the news, adding, "Written and produced by Justin, the epic album will feature 10 all new songs that explore the sonic boundaries fans discovered with the music found on this year's earlier release." Check out Timberlake's video for "Mirrors" below.